Datura Blanche is a popular perfume by Keiko Mecheri for women and was released in 2007. The scent is sweet-powdery. The longevity is above-average. It is still in production. I dared to bring home a strongly reduced Datura Blanche in a dark blue bottle. I originally gave him a 6.0 rating. The sample that I had a few years ago smelled unexpectedly soapy and bitterly woody. I found it disgusting back then. However, the resemblance to Hypnotic Poison is emphasized here again and again and I wanted to know it again. Maybe the sample was spoiled? No, I don't smell hypnotic poison. Neither at the beginning, nor in the middle, nor in the base of the fragrance. I have a bottle here now and it smells very different. It smells milky and floral with a kind of tonka vanilla. It is also powdery, but also slightly bitter, like Tonka milk with poison. This is for me the only poison here in the fragrance, something bitter. For me, Datura Blanche still needs getting used to. In the beginning it smells tangy and bitter, no idea, almost unpleasant chemically, but it doesn't stay that way. It gets milky pretty fast. I don't want to call it gourmandig directly, because my natural shyness for poisons in the food still lets me back down a bit here. I don't like eating or drinking with this aroma. But even after a good 40 minutes it still has something slightly bitter and poisonous. It is warm Tonka vanilla milk to smell, but also something to be enjoyed with caution. Later I recognize a part of HP in this fragrance - powdery vanilla. However, no direct association with him seems to me. It is not plausible to me why he should have such similarity according to other noses. Datura Blanche is well wearable in winter. However, with the warm Tonka milk it also remains a bit bitter in my nose. As a man I would think that the wearer could be enjoyed with some caution after all. Although it seems to be sweet and drinkable on the surface, it may not be as well tolerated. For a long time I was wondering if this fragrance would be something for me. I am certainly a perfume addict and so you are always looking for something different. At the moment I am on the gourmet track, but don't want to get stuck. So I had to get a bottle of Datura Blanche, full of tension I finally sprayed the scent on the back of my hand. A beautiful, delicate scent of blossoms blew around me, but quite quickly an unpleasant, pungent smell drew from the back of my hand. I couldn't categorize it, maybe the jimsonweed I've never smelled before. I was so disappointed:((( the beginning was very nice. But Parfumo has taught you not to give up so quickly. Fragrances need time, just try a second and third time. And it's true, I don't take a pungent scent anymore, in the beginning the enchanting flower scent, vanilla, almond and tonka bean let Datura become a beautiful creamy warm flower scent, but without the flowers becoming too powerful. I feel the scent harmonious and balanced, unfortunately my daughter also ;( and nu I have no more Datura. But the dear perfumers can quickly find a remedy, and so another bottling is ordered. If a bottle will move in with me, let's see.. The durability is quite good, holds with me approx. 7 h. The Sillage is manageable and thus I would carry the smell actually always. As with all fragrances, it depends on the dosage. I think, there is a significant difference between joy and gladness. Gladness is when things are going well, I am calm, I enjoy the life and so on. Joy is a much more temperamental and shorter feeling, when e.g. people are laughing while sitting on a roller coaster. Some perfumes make me glad and I really like to wear them, but DATURA BLANCHE caused me grinning, almost giggling, when I smelled. My beloved tonka bean makes the fragrance more powdery as time is progressing, so the end is more dry, but still sweet. I can see on the right side, that "Users who like Datura Blanche often also like: By Night White by Profumi del Forte" - YES! For sure! I would recommend this scent only to people who like sweet fragrances for summertime. I am really grateful for the sample, what I got from a really nice Parfumo-member. I will use it up very soon. 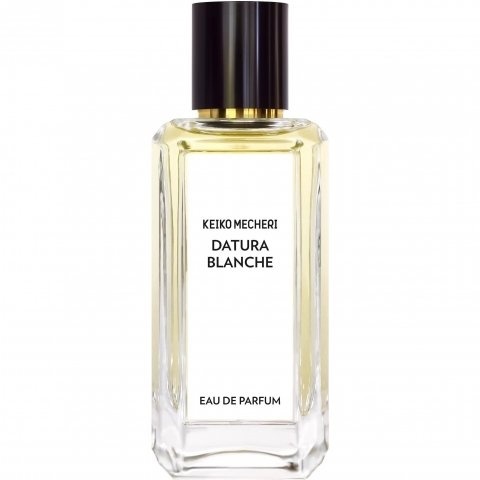 Keiko Mecheri DATURA BLANCHE is a truly scrumptious and voluptuous oriental perfume. I am reminded very much of Dior HYPNOTIC POISON, except that the Playdoh and rootbeer aspects of that perfume are not salient here. I'm afraid that I still do not know what datura smells like--I certainly could not pick it out of a line-up of flowers! Chez Serge, datura was overwhelmed by tuberose; chez Keiko, I'm smelling mainly almonds and heliotrope. This creation is going to be loved by anyone who loves HYPNOTIC POISON, but also some of those who find that one to be a bit too much. DATURA BLANCHE seems more refined and less pushy to me. But it is definitely a cold weather perfume, as this is a sweet, strong oriental leaning even a bit toward the gourmand side. I'd say that overall DATURA BLANCHE is a nice compromise between the sweetness of the loukhoum trio and some of the other floriental perfumes of this house. I would love to have a bottle of this creation for wintertime. I'm sure that it would waft beautifully as it heats up on the skin under a sweater. The concentration is definitely eau de parfum, not eau de toilette: this a potent, enticing elixir! Initially a sweet, light and airy floral. I've never smelled a datura flower, but the floral smell I get here reminds me of a combination of ylang ylang and frangipani. I think it's the heliotrpoe that adds the powderiness I also find in this perfume. After a few minutes a nice creamy vanilla aroma emerges to mix with the florals. Unfortunately, I find the final drydown to be pretty much just vanilla ice cream and powdered sugar. The florals really fade into the background and this becomes a not very original, sweet powdery gourmand scent that I know I have smelled somewhere before (just can't remember what it was). Another Keiko Mecheri I've tried, Loukhoum Eau Poudre, is also a powdery and foody perfume, but IMO is more interesting and distinctive than Datura Blanche. Write the first Review for Datura Blanche!